Conec is dead, my dear readers. JCCUL (Jamaica Co-operative Credit Union League) shuttered the service stat began operating in 2013, leaving Quisk from the NCB Financial Group, and GK-MPay, offered by the GraceKennedy group. According to the JCCUL, they’ve redeployed staff from the project to other more important parts of the company. JCCUL is operated Conec through JaMobile Payment Services and developed with the assistance of technology partner, Mozido LLC. Basically, US$2 million just went up in smoke, but the JCCUL has to pay licenses and maintenance fees to their software provider, Mozido LLC, who are still holding on to the software, should Jamaicans suddenly become engaged, to quote Glenworth Francis: “Mozido had transferred its interest to M-Conec, which is a subsidiary. M-Conec is now just our software provider. The relationship will cease as with any other software provider. We paid license and maintenance fees”. Conec did not die to rivalry with QUISK and MPay; it died because albeit they were first to market, Jamaicans did not embrace the concept of a Mobile Wallet as expected. 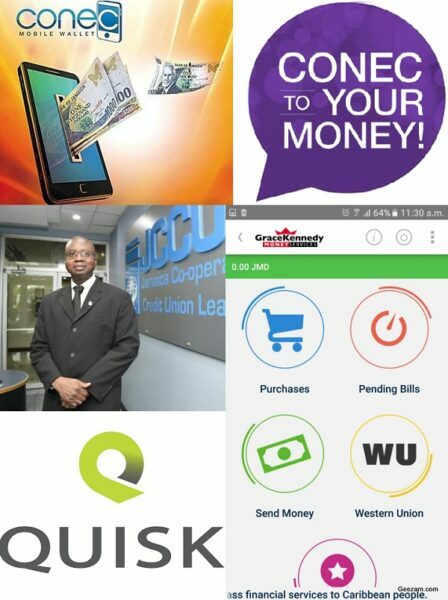 As I’d pointed out in my article How to get Jamaicans to use Quisk, GK MPay for more than just Phone Credit, a friendlier API, better marketing and tying the usage of Mobile Money to an essential service will make Mobile money take off in Jamaica. These changes are needed to jump-start adoption in a country that loves to have money in hand and not in a bank. Still, JCCUL started it all; they are now making adjustments to comply with changes to the Credit Union Act, which will see them coming under the control of the BOJ (Bank of Jamaica). This means the JCCUL which consists of an umbrella group of 28 credit unions, will fall under the watchful eyes of the BOJ and its regulations oversight come March 2018 as pointed out by Glenworth Francis: “The credit union movement is going to be faced with the new Credit Union Act, for which they will have to prepare themselves. There is quite a bit of expense related to the cost of compliance and regulation. For example, you have to ensure that you beef up your reporting structure”. They are also focusing on their core business again as IFRS 9 comes on stream in 2018. The new IFRS accounting rule regarding the valuation of securities and loans mean that they’ve have to spend a total of JA$300 million to upgrade software and connectivity between credit unions. So for now, the Mobile Money arenas is left up to GK MPay and Quisk, who now have to become relevant or end up tossing in the towel, despite the US$2 billion Remittance Prize at the end of the tunnel.